If you're traveling to the Dominican Republic consider making a trip to Puerto Plata ('Port of Silver') which is about 200km northwest of Santo Domingo. Among its other attractions are the must-see Damajaqua Cascades, a series of 27 waterfalls located on the Rio Bajabonico, that snake down a mountain wilderness through a series of crystal clear pools. To fully appreciate this natural wonder you can hike up the mountain for about an hour until you reach the top of the falls then work your way down by jumping or sliding through each waterfall. You need to keep in mind that this is not for the faint of heart (you need to make jumps of 10-20ft regularly) and the swim can be quite challenging physically. Whilst children as young as eight are allowed to go to the first waterfall, cascading the falls is really only suitable for teens and adults. If you're not up to something so strenuous you can take a less demanding tour that covers only seven of the falls. It is imperative that you hire a guide and the appropriate equipment (shoes, helmet, life-jacket) if you're planning to cascade the falls. The local guides are friendly and knowledgeable and will help you over difficult sections of the hike as well as advising the best approach downwards through the falls. Whilst the falls are beautiful and calm in the summer months, after rain they can become a raging torrent and potentially quite dangerous and in these circumstances a little local knowledge goes a long way! The Damajaqua falls are an exhilarating and unforgettable experience and one you should not miss when visiting the Dominican Republic. 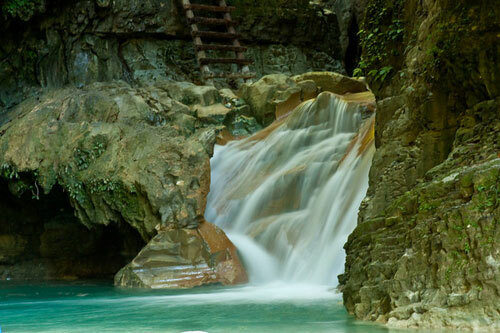 Damajaqua Cascades is located in Puerto Plata, about 200km northwest of Santo Domingo. It'll take you about 25 minutes to reach the cascades, which are west of Puerto Plata along the Damajaqua River. Last updated by Ivan Volaric on 10 February, 2014 in Destinations.